Join us on Dad’s Weekend for a smashing good time at the 14th Annual Pumpkin Drop. 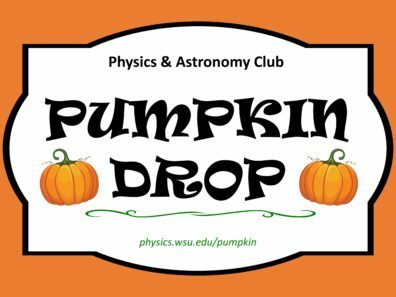 Sponsored by the Physics and Astronomy Club, this pre-game, gravity-bound extravaganza celebrates the fun side of science by dropping pumpkins of all shapes and sizes from the highest point in Pullman: the 12th floor of Webster Hall. Additional entertainment and demonstrations for kids of all ages will be on site as well. Activities begin at 11 a.m. with the main event at 12:45 p.m.